Dwight Pilgrim joined Rich & Cartmill in 2013 as an Associate. He has been an agent specializing in Surety Bonds and Insurance for Construction clients since 2003. From 1987 to 2002 he was in the senior management of surety companies and prior to entering the surety business worked for an international accounting firm and in banking. 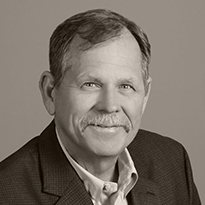 Dwight is a proud 1975 Graduate from Oklahoma State University and holds the Certified Public Accountant, Chartered Global Management Accountant, Certified Insurance Counselor and Construction Risk Insurance Specialist designations and is a past president of the Oklahoma Surety Underwriters Association. He is a past recipient of the Oklahoma Municipal Contractors Associate member of the year and active in most construction trade organizations. He enjoys golf, movies and spending time with Nikki, his wife since 1975. The Pilgrim family attends First Baptist Church in Edmond, Oklahoma.